Internet history is tied in many ways to the history of computers and electronics. Many people consider Charles Babbage the inventor of the computer. He designed the first programmable computer, though he was not able to see it executed in his lifetime. An early collaborator who is considered the first computer programmer was August Ada Lovelace, who was also the daughter of the poet Lord Byron. She has a Department of Defense programming language named after her, Ada, as well as an online repository of Internet art, äda. We will see that many different contributors have allowed the Internet to develop into the universally used technology that we are familiar with today. Governments, hobbyists, artists, scientists, corporations and many others had a hand in developing the Internet. Early contributors to theories that would eventually allow for electronic computing include George Boole, who developed a binary system for math that could represent complex mathematical equations with true/false statements, or the 0s and 1s that we talk about as the basis of electronic communication. Electrically operated computers were developed in the mid 20th century by a German engineer named Konrad Zuse. The British mathematician Alan Turing developed computers and did some of the first experiments with artificial intelligence. Grace Murray Hopper is considered the first 20th century woman involved in the development of high level programming languages. As a high ranking Naval officer and leader in computer development for the US military, she is credited with discovering the first computer “bug”, which was an actual bug that had flown into the circuitry of the computer. Further innovations in computer technology include the ENIAC machine, or Electronic Numerical Integrator and Computer, the first digital computer used by the US Army to calculate ammunition trajectories. The first commercially available computer was the UNIVAC, the Universal Automatic Computer, which used a microchip. By the 1970s, silicon chips had been developed to hold the basic components of a computer, the central processing unit, the memory and the controls. This led to the release of personal computers by IBM and Macintosh in the 1980s. Along with Douglas Engelbart’s “mouse”, these computers were developed until in the 1990s the first affordable personal computers were introduced. 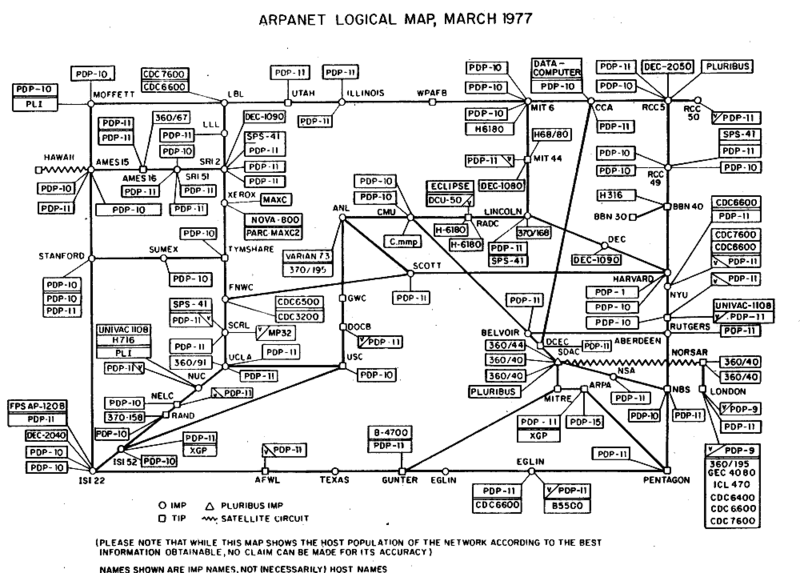 The history of the Internet in many ways begins with ARPANET. The Internet is a “network of networks”, or many different computers and servers connected by standardized communication protocols. Researchers started building computer networks in the 1960s and 70s. The ARPANET was one of the first such networks, which sent messages between academic labs in California. The ARPANET was a combination of several computer networks linked in order to increase computing power and decentralize information storage. This was motivated in part by the US government concerns for security in case of something like an atomic bomb destroying the information in one set of computers or network. Academic institutions proposed different solutions. This was all done across phone lines, bits and bytes transferred as 0 and 1. Much of the work involved was creating standards that different computers could understand and interpret to make communication with electronic signals possible. ARPANET used packet switching, a digital networking method that divides documents or pieces of data into smaller blocks, or packets, which can be shared across multiple communication channels. Many of these standards, like File Transfer Protocol, which we will cover in a later class, still exist, while others have been replaced as electronic technology has become more complex. ARPANET made things like FTP, remote login and email possible. Once email was standardized, developers created mailing lists that could send messages to groups of people at one time. One of the first such mailing lists was about science fiction. This was controversial. Eventually ARPANET became outdated, around 1990, but it laid the groundwork for a lot of what we know as the Internet today. There were many networked computer systems used for file sharing and communication that predate the Internet that we use today. Gopher was a browser that looked and functioned more like a basic file system. BBS systems (Bulletin Board Systems) allowed users to connect to a server using a terminal program to post public messages, send emails and files to other users and other features like games and chat rooms. While these networks were being developed, the idea of hypertext was developed independently. Hypertext is a form of electronic text documents that use links, called hyperlinks, to connect other documents from words or phrases within a document. Hypermedia is the use of these links for media like images, video and audio. The term hypertext was coined by the technologist and writer Ted Nelson, who developed and continues to develop a hypertext system called Xanadu, which differs from the hypertext that we know in that the path between links, or the original document that is linked, is always saved in memory, so it would be impossible to send a link was not traceable back to its origin. Nelson disagrees with the current implementation of hypertext on the Internet that most people are familiar with and continues to develop and advocate for his conception. 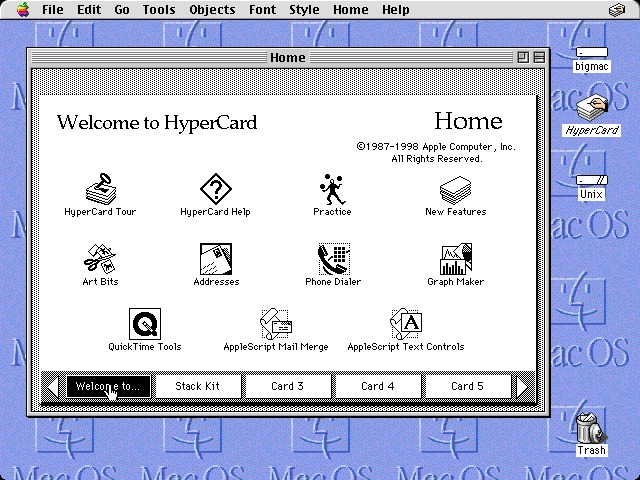 Hypercard was a application developed by Bill Atkinson for Mac computers in 1987 which was one of the first programs to popularize hypermedia, or media that could link to other media. The Internet we know was born as the World Wide Web, created by Tim Berners-Lee by combining Hypertext with a network like the ARPANET. He created the web to make an efficient way of doing research and communicating through the Internet, making information available in a decentralized way through hypertext. The World Wide Web is a network of linked hypertext documents linked by the Internet. The development of the Internet started with research done at CERN, the European Organization for Nuclear Research, one of the world's largest particle physics laboratories. 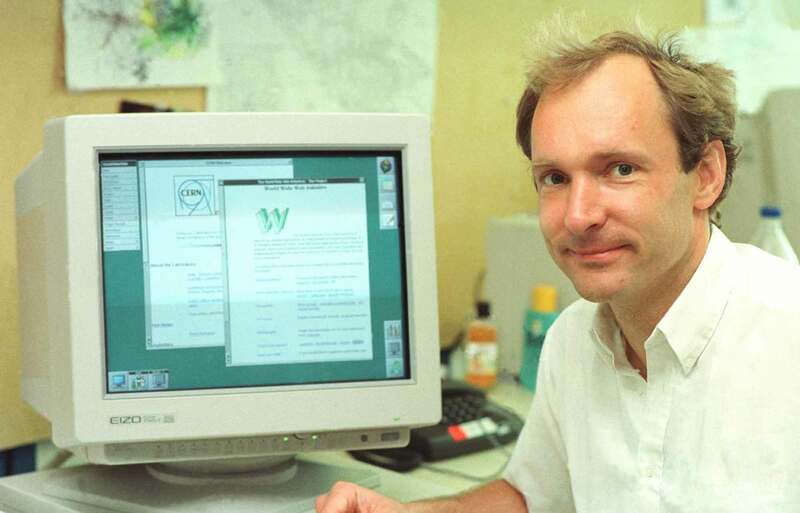 Tim Berners-Lee is the director of the World Wide Web Consortium, W3C, which oversees the development of the web. In 1989 he facilitated the first communication over the Internet via Hyper Text Transfer Protocol, HTTP. This was the culmination of many different Internet technologies and concepts — the marriage of HyperText and Internet communication. He is responsible for the standardization of protocols using HTML and URI, universal resource identifiers, which connected computers with documents on different servers. He worked very hard to create a standardized system that could be used by everyone, not just governments, corporations or computer scientists. His philosophy is responsible in many ways for the open standards of web development that still exist today. Stand HTML has source code was available to anyone to view, and so web development was easy to learn, replicate and disseminate. He resisted ideas like copyright in order to make information freely accessible to anyone with a computer. He chose not to profit off of his work in the way that many other tech companies did in the 90s, believing in the freedom of information and collaboration. HTML is relatively limited in its ability to render information. Software based on other languages like Java are more dynamic, but are harder to implement on a variety of machines. The relative limits of HTML are outweighed by the benefits of being easily recreated on different machines and browsers, allowing for users and developers to use HTML in a variety of ways that it was not originally intended. The Web relies on many underlying technologies and standards. HTTP, or HyperText Transfer Protocol, provides a standard of communication between severs and web clients, or browsers, to communicate and transfer hypertext documents. The Internet Protocol Suite is a set of communications protocols, including TCP, Transmission Control Protocol, which defines how data is formatted, addressed, transmitted and routed, and IP, which defines how data is distributed across networks. HTML, or Hypertext Markup Language, which was formalized in 1991, is the basic language used for formatting web pages. It was developed from Generalized Markup Language which was created in the 1960s. These protocols and standards facilitate communication between servers, which are hardware and software platforms designed to make web pages accessible over the World Wide Web. Originally, these were hosted by individuals, such as Tim Berners-Lee, and you can still host a website from a server in your home, but most of the work of serving web pages has been taken over by large organizations like Google or Amazon. A web client is a device with software enabled to recieve web pages from servers. Running Chrome or Safari on you Apple computer is an example of a web client.